Ken Block might be the driver behind the wheel of the sweet rides in the Gymkhana videos, but the real star of the show is always the cool car Block uses. In the Gymkhana 10 video that will debut next month, Block won’t drive a car, he will be hooning a 1977 Ford F-150 truck. Block says he chose a 1977 F-150 because his dad had one growing up and he learned to drive and do burnouts in it. Block’s F-150 is not stock. 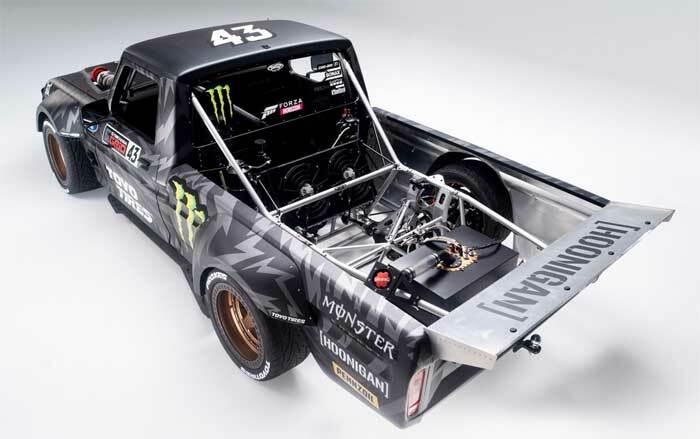 It has a tube frame chassis, 914hp EcoBoost Ford Racing V6 from the Ford GT, a sequential 6-speed transmission, and an all-wheel-drive system. We don’t get to see the truck in action just yet, but it sounds mean. Block and his cohorts answer questions about the truck in the video above.